The handset looks good but is very heavy, also the performance is just about okay. Bluboo Edge is available for $141 (approx Rs. 9,500). Not really a good option, plus if you import into India you will need to pay extra custom duty – not worth. At an asking price of just $129 BLUBOO Edge is the only smartphone that is offering a gorgeous phone. It will turn heads around you when its your hands thats the kind of classy looks it has. also you get decent hardware for the price. So this is must buy device if you are tech savvy and want to own the latest technology in the market. You can get BLUBOO Edge here for just $129.99 so hurry ! Positive: Fast fingerprint sensor; good price. Negative: Weak hardware. Model: The Bluboo Edge is a smartphone with a curved screen panel on the front, which goes all the way from one side to the other and leaving minimal space for side bezels. 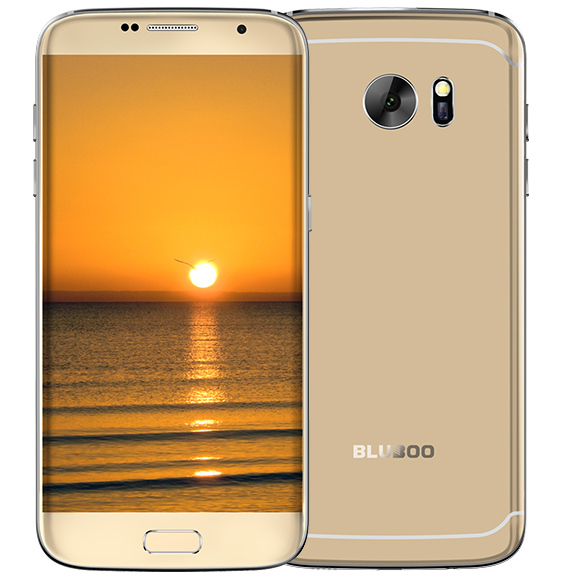 Compared to most of the smartphones with curved displays around, which are usually on the expensive side, the Bluboo Edge features a curved display with mid-range hardware at a very competitive price. The Edge is designed to look like a special jewel with a metal frame at the side of its glass back. The panel under the glass on the back has a special stereoscopic engraving, which gives its shiny colors depth and enhanced glare effects. The corners of the phone's rear are arched to provide better ergonomics and a look that fits the curved glass on the front. The Edge implements advanced nano moulding craftsmanship to make the nano-plastics precisely meet the metal frame. As for hardware specification, it features a quad-core MediaTek MT6737 processor. The graphic processor of the smartphone is an ARM Mali-T720 GPU. The phone has 2 GB of RAM and 16 GB of internal storage, which is expandable by up to 256 GB via microSD. The phone supports 4G LTE over band 1 (2100 MHz), band 3 (1800 MHz), band 7 (2600 MHz), and band 20 (800 MHz). It can hold two SIM cards and supports dual standby. However, running dual SIM on this smartphone will require the user to sacrifice the microSD slot. The Edge's display is a 5.5-inch panel with a 720 x 1280 pixel resolution, protected by a sheet of scratch-resistant Gorilla Glass 4. A curvy display comes with a rather brittle marginal part which Gorilla Glass 4 can overcome the issue by thickening the weak margin of the touch panel. There is a dual-layer touch panel underneath the glass, which makes sure the phone will detect the faintest tap. It can be operated with gloves or even wet hands. The main camera features an 8 MP Sony IMX219 sensor and the selfie snapper is a 5-MP camera. Bluboo employs some software interpolation magic in order to enhance the camera capabilities, which is capable of enhancing the quality of the photo taken by the rear-facing camera up to 13 MP, while the front camera can be interpolated up to 8 MP. The rear camera is also paired with LED flashlight which enables users to take detailed and sharp pictures under low-light condition. The Bluboo Edge also has a built-in heart sensor which makes it easier to monitor the user’s heart status and get access to real-time heart rate data. This is a rather distinctive feature, which is less implemented on other smartphones. Running on Android 6.0 Marshmallow, it delivers lower power consumption and higher efficiency to run applications. If curved screen smartphones such as the Samsung Galaxy S7 and Huawei Mate 9 have grabbed your attention but are too costly, fear not as the Bluboo packs the same thing for a more affordable price tag. In 2009, the Shenzhen Huihua Exploit Technology Co LTD established the brand Bluboo in Hong Kong. The brand is focused on smartphones. Internationally, the brand is not too important. There are hardly any reviews, and in the few cases, the rating is rather underwhelming (as of 2016).